Past Promotions - Yoga Inc.
Yoga Inc 5 th Anniversary Coloring Contest! How many Yoga Inc Kids can u spot? higher chance of winning if you get their colors right! *Artwork by our member hoppinghope! ​a 5 class package worth $125! 5 winners will be selected and announced on 2nd Jan 2019! from 2-8 Jan 2019, while stocks last. Our anniversary promotion can also be purchased online! * Min 3 kids to start. We seek your understanding that the class you booked maybe canceled if there are not enough signups! We will inform you at least 3 days in advance with a full refund. Booking upon payment online or at our studio. Let your kids experience the joys of yoga through fun and play! Yoga at an early age encourages self-esteem and body awareness with a physical activity that's non-competitive. Fostering cooperation and compassion instead of competition is a great gift to our children. The main emphasis of this class is FUN! Children are encouraged to use their creative imagination, express themselves vocally and physically, in a wild adventure; sometimes through the forest, into the outer space or travelling around the world! All Yoga Inc 's proceeds will be donated to Willing Hearts! 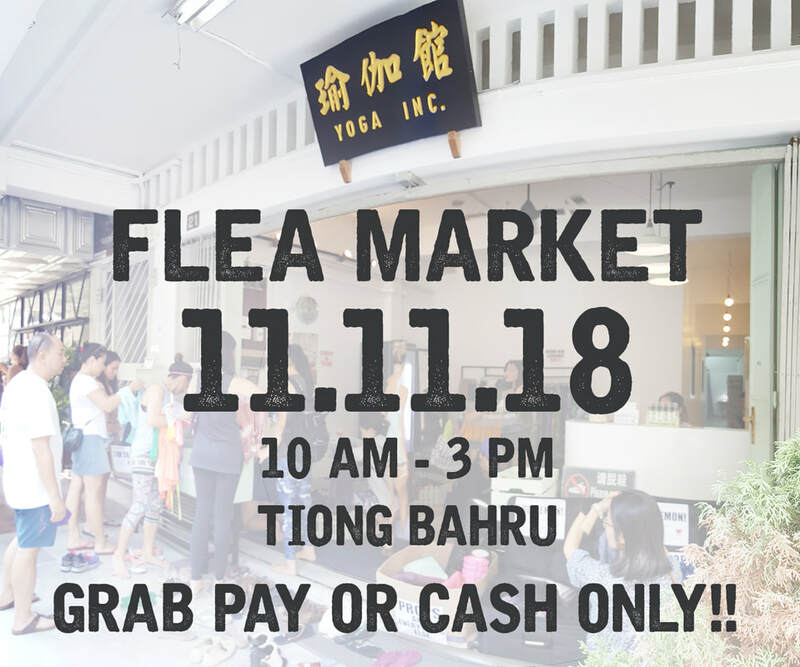 ​YOGA INC FLEA MARKET IS BAACCCCCK!!! ​We are helping our shopaholic teachers and friends sell their preloved yoga apparels and accessories..... so they can buy more! Our past seasons' apparels will also be on clearance sale of up to 70%! ​Come grab yourself a bargain! Yoga Inc 30- Day Challenge! For the month of Sep- Oct 2018, we'd like to challenge you to attend our classes for 30 CONSECUTIVE days and experience the awesome physical , mental and physiological benefits of a daily practice! Upon completion, you will be rewarded with a great sense of achievement plus 10 free classes! You can start the challenge on any date, between Sep - Oct, but the last day cannot be later than 31 Oct 2018. No registration needed. Upon completion, you just have to tell the front desk " I COMPLETED THE 30-DAY CHALLENGE!" and we will check your visits. You can attend any regular classes at any outlets at any time. Of course, you'd need to have a package to attend our classes la. An unlimited package is recommended but it's totally up to you. The 10 free classes will be valid for 3 months from the date of redemption. they are strictly non extendable and cannot be carried forward. 30 consecutive days means 30 days consecutive hor. Come dressed up and have fun! 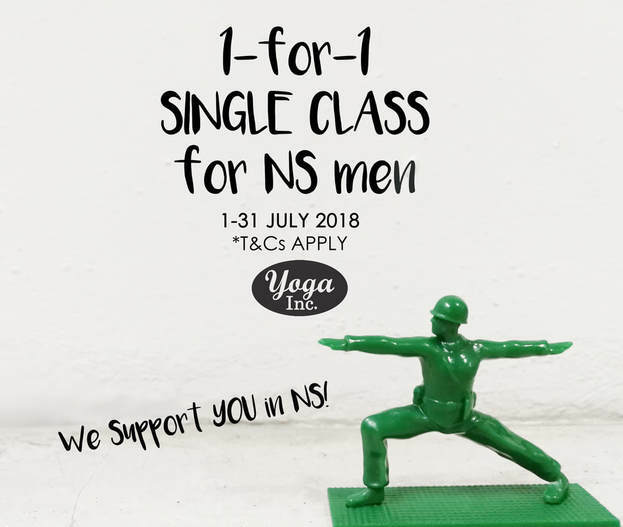 ​This July, Yoga Inc would like to thank our National servicemen for your dedication and contribution to national defence and security! The free class can be shared with someone else on the same day, or you can keep it for yourself to be used within 3 months. so they can buy more! You will be able to find good quality or even brand new items from Lululemon, Onzies, Liquido, Tonic, Teeki, Nike, Adidas etc. Come grab yourself a bargain! Keen to sell your stuff at our flea market? Please drop your items at any of our outlets during our opening hours, latest by 13 Aug. There will be a "3 for $10" Box, where 100% of the sales will be donated.